Known for their “yokan,” a red bean-based jellied dessert, Toraya has been a premier maker of traditional Japanese confectionery for over 480 years. ATAGO hand-held refractometers have been used to check the sugar content of sweet bean paste called “an,” a critical ingredient for “wagashi,” traditional Japanese confections. The manufacturing facility is surrounded by the bounty of nature and has a magnificent view of Mount Fuji. The pure and clean water from Mount Fuji is one of the quality ingredients for “wagashi,” Mr. Tsuchiya, Production Manager, gave us a tour of the facility. What are manufacturerd at this facility? We specialize in making “an,” which is the most important base ingredient for many different types of ”wagashi.” Other main products we make here include “yokan” and “monaka,” a thin crisp wafer sandwich with red bean jam filling. The plant in Tokyo uses “an” that is made here to produce other sweets. Making “an” is not as simple as it sounds. There are over 40 different types. It all starts with the type of “azuki” beans used. We have many different “an” recipes to make the type most suited for each confection. First, the beans are cooked, and after the skin is removed, they are mashed into a paste. 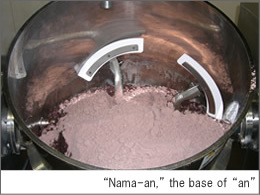 This is called “nama-an,” the base of “an.” Experienced confectioners measure the moisture level of “nama-an” and determine the desired sugar level after the beans are cooked. Next, “nama-an” is cooked with sugar and water until it reaches a certain level of sugar content and texture. 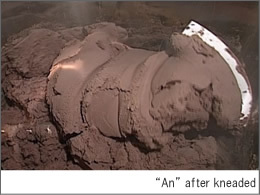 Confectioners very much rely on their expertise to determine whether or not “an” has reached the right texture. 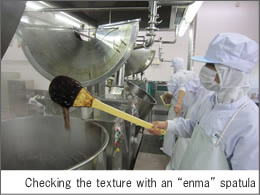 Evaluation methods and indicators are different by “an” type, so instinctive judgment on such criteria as the feel when stirred with a large spatula called “enma,” and the texture as the mixer’s paddle is lifted are critical. We use a refractometer to check the sugar level. Not only does the moisture level of “nama-an” before cooking vary to begin with, but also each cooking tank has its quirks. 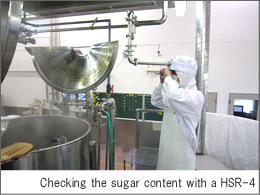 Therefore, the factory supervisors set different target sugar levels for each recipe and for each tank. Our standards are adjusted and measured in an increment of 0.2% Brix. How many cooking tanks are there? We see a lot. We have a total of 28 here. The cooking capacity per tank is anywhere from 100 to 500 liters. How many tanks does one operator manage? An operator is in charge of about 10 tanks at any given time. Sometimes, they move from a tank to the next every 8 minutes. Do you use refractometers for other purposes? When making “yokan,” we use refractometers to measure “an” and also a sweetened agar solution before they are added to the tank. Finished products are also checked with refractometers, according to the quality control standards. We literally use them throughout the production process. 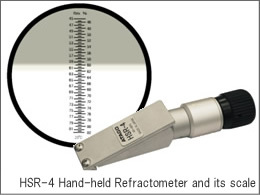 Do you have a refractometer designated for each production stage? That is correct. The one the Quality Control department uses is the master unit, and all other units are calibrated to that unit at the beginning of every day. We visited the Quality Control lab. We visited the Quality Control lab. The room was perfectly temperature-controlled. We were able to observe how a thin slice of “yokan” was measured with a hand-held refractometer (the N-2). The sugar level and texture are the main check points as their “yokan” is known for its characteristic firmness and sweetness accompanied by a pleasant aftertaste. How long have you been using refractometers? According to the oldest employee at the factory, we have been using them since 1963. ATAGO’s first hand-held refractometer was developed in 1953, which means that you have been a loyal customer of ours from the very early days. Since then, our refractometers have gone through many model changes. We revived the once-discontinued HSR-4 by your request. This model is absolutely indispensable for us. The sample temperature could reach as high as 100°C, and we cannot afford waiting for it to cool down to measure. We have tried the digital model but decided that the analog type is best for us. Thank you very much for taking the time to interview with us. We sincerely appreciate your continued support of ATAGO refractometers.